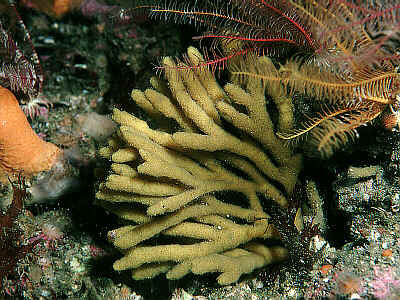 Description: A yellow to orange coloured branching-erect sponge which can grow to a height of 10cm. The branches in this species are rarely fused (c.f. Stelligera rigida). It has a bristly surface which often traps particles of silt. This species exudes quantities of slime when taken out of the water. 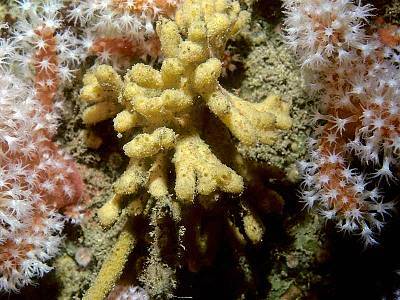 Habitat: A typical species of the circalittoral zone, found on open rock, crevices and stones. Distribution: A common species throughout the British Isles, at least on western coasts. 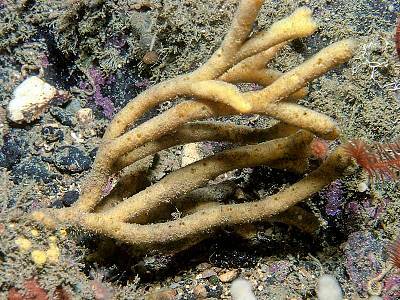 Similar Species: Production of slime in a hairy, free branching sponge is probably indicative of Stelligera stuposa. The species with which it is most frequently confused is Raspailia hispida however this species does not produce slime. 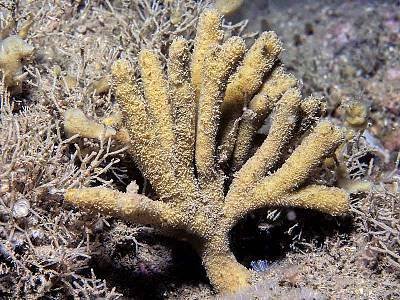 Branching-erect yellow sponge in which branches rarely fuse. Production of slime when out of water. Picton, B.E. & Morrow, C.C. (2016). Stelligera stuposa (Ellis & Solander, 1786). [In] Encyclopedia of Marine Life of Britain and Ireland.